The following words are terms used in sumo wrestling in Japan. Hold. A kind of draw. After a mono-ii, the gyōji or the shimpan "holds" the result if it was too close to call. In 1927, the system was abolished and a torinaoshi (rematch) now takes place instead. List of sumo wrestlers according to rank for a particular grand tournament, reflecting changes in rank due to the results of the previous tournament. It is written out in a particular calligraphy (see sumō-ji) and usually released on the Monday 13 days prior to the first day of the tournament. Outsider to the list. A wrestler who is not yet ranked, or has fallen off the banzuke due to injury or other reason for non-participation. Venue. Any sumo tournament. Compare honbasho. Also called binzuke abura (binzuke oil). A Japanese pomade, which consists mainly of wax and hardened chamomile oil that is used to style sumo wrestlers' hair and give it its distinctive smell and sheen. It is used exclusively by tokoyama hairdressers. A stew commonly eaten in large quantities by sumo wrestlers as part of a weight gain diet. It contains dashi or stock with sake or mirin to add flavor. The bulk of chankonabe is made up of large quantities of protein sources, usually chicken, fish (fried and made into balls), tofu, or sometimes beef; and vegetables (daikon, bok choy, etc.). Power-water. The ladleful of water with which a wrestler will ceremonially rinse out his mouth prior to a bout. It must be handed to him by a wrestler not tainted with a loss on that day, so it is either handed to him by the victorious wrestler of the previous bout if he was on the same side of the dohyō, or if that wrestler was defeated, by the wrestler who will fight in the bout following. This system works well until the last match of the day (musubi no ichiban, 結びの一番) when one side will not have someone to give them the power water. This is due to the fact that one of the sides from the previous match lost and there is no next match, so there is neither a winner from the previous match, nor a next wrestler to give them the water. In this case a winner from two or three prior matches will be the one to give them the power water. This wrestler is known as the kachi-nokori (勝ち残り), which means the winner who remains. Traditional Japanese haircut with a topknot, now only worn by rikishi and so an easy way to recognize that a man is in the sumo profession. Retirement ceremony, held for a top wrestler in the Ryōgoku Kokugikan some months after retirement, in which his chonmage, or top knot is cut off. A wrestler must have fought as a sekitori in at least 30 tournaments to qualify for a ceremony at the Kokugikan. Constant forward movement. Term used to refer to when a wrestler continuously moves forward as opposed to moving backwards or being moved backwards. The ring in which the sumo wrestlers hold their matches, made of a specific clay and spread with sand. A new dohyō is built prior to each tournament. Ring-entering ceremony, performed only by the wrestlers in the jūryō and makuuchi divisions. The east and west sides perform their dohyō-iri together, in succession; the yokozuna have their own individual dohyō-iri performed separately. The main styles of yokozuna dohyō-iri are Unryū and Shiranui, named after Unryū Kyūkichi and Shiranui Kōemon. A yokozuna performs the ceremony with two attendants, the tachimochi (太刀持ち, sword carrier) and the tsuyuharai (露払い, dew sweeper). Picture banzuke with paintings of top division sekitori, gyōji and sometimes yobidashi. "Sold out," meaning that seats are 100% sold out. In contrast to man'in onrei which means full house and can be claimed when seats are anywhere between 75-95% filled, depending on what the officials decide. Also pronounced, mitsu. General term referring to a loincloth, ornamental apron, or mawashi. A loss by default for not appearing at a scheduled bout. If a wrestler withdraws from the tournament (injury or retirement), one loss by default will be recorded against him on the following day, and simple absence for the remainder. A win by default because of the absence of the opponent. The system was established for the honbasho in the May 1927 tournament. After the issue of Hitachiiwa Eitarō, the system was modified to the modern form. Prior to this, an absence would simply be recorded for both wrestlers, regardless of which one had failed to show. Pushing the opponent with the torso. A war fan, usually made of wood, used by the gyōji to signal his instructions and final decision during a bout. Historically, it was used by samurai officers in Japan to communicate commands to their soldiers. Technique prize. One of three special prizes awarded to rikishi for performance in a basho. The decision following a mono-ii affirming the gyōji's original decision. Literally, "according to the gunbai". The decision following a mono-ii reversing the gyōji's original decision. Literally, "referee pointed the gunbai incorrectly". The phrase shouted by a sumo referee during a bout, specifically when the action has stalled and the wrestlers have reached a stand-off. It means, "Put some spirit into it!" The two main east and west "paths" leading from the preparation rooms to the dohyō. Overhang. If there are more than two wrestlers at any san'yaku rank, the additional wrestlers are termed haridashi. Prior to 1995, such wrestlers were listed on the banzuke in extensions or "overhangs" to the row for makuuchi wrestlers. This is now an informal designation, since presently all wrestlers are listed within the normal bounds of the row. Pushing up with hands under opponent's armpits. Hazu refers to the nock of an arrow where it makes contact with the bow string. Hazu can also mean the nock-shaped area of the hand between the thumb and forefinger, so in this case means using the hazu of the hand to lock into the armpit of the opponent and push them upward to prevent them from getting a hold of one's belt. A sidestep to avoid an attack. If done, it is usually at the tachi-ai to set up a slap-down technique, but this is often regarded as bad sumo and unworthy of higher ranked wrestlers. Some say it is a legitimate "outsmarting" move, and provides a necessary balance to direct force, "henka" meaning "changing; to change". The most senior-ranked wrestler in a stable (or heya). A draw. Though common in early sumo, it is very rare in the modern age. Non-technique. A winning situation where the victorious wrestler did not initiate a kimarite. The Japan Sumo Association recognizes five hiwaza. See kimarite for descriptions. A professional sumo tournament, held six times a year in the modern era, where the results affect the wrestlers' rankings. The wooden sticks that are clapped by the yobidashi to draw the spectator's attention. A group of related heya. There are five groups: Dewanoumi, Nishonoseki, Takasago, Tokitsukaze, and Isegahama. These groups tend to cooperate closely on inter-stable training and the occasional transfer of personnel. All ichimon have at least one representative on the Sumo Association board of directors. In the past, ichimon were more established cooperative entities and until 1965, wrestlers from the same ichimon did not fight each other in tournament competition. To sidestep or dodge. As opposed to when done at the tachiai when it is referred to as a henka, inashi is done after the initial tachiai to catch the opponent off guard and force him out in another direction. High rankers. A term loosely used to describe wrestlers who would expect to face a yokozuna during a tournament. In practice this normally means anyone ranked maegashira 4 or above. The second-lowest division of sumo wrestlers, below sandanme and above jonokuchi. An expression meaning this is only the beginning. The lowest division of sumo wrestlers. Regional tours in Japan and sometimes abroad, undertaken between honbasho, during which the wrestlers give exhibition matches. An informal designation for a second-place finish in a sumo championship. Ten ryō, for the original salary of a professional sumo wrestler. The second-highest division of sumo wrestlers, below makuuchi and above makushita, and the lowest division where the wrestlers receive a salary and full privileges. Literally translates as defending hand. When the two wrestlers fall together, the wrestler on the lower side is referred to as shini-tai, or dead body, meaning that he is the loser even if he doesn't touch the ground first. In this case, if injury is foreseen, the wrestler on the upper side is allowed to support his weight by sticking out a hand on the ground (kaibai-te) prior to the shini-tai wrestler touching the ground first. Although the wrestler on top touches first, he is still declared the winner. Technique where the wrestler folds his arms and rushes forward to hit opponent's chest or chin to make his posture upright. This is most commonly done at the tachi-ai and can also result in stunning the opponent. Literally translates as striking upward. The first kanji character is uncommon and is also the one used to describe polishing rice or pounding mochi cakes. More wins than losses for a wrestler in a tournament. This is eight wins for a sekitori with fifteen bouts in a tournament, and four wins for lower-ranked wrestlers with seven bouts in a tournament. Gaining kachi-koshi generally results in promotion. The opposite is make-koshi. Kachi-nokori literally translates as the winner who remains. 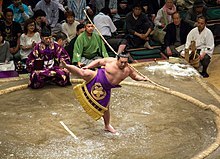 During a day of sumo the power water is only given to the next wrestler by either a previous winner on their side of the ring or the next wrestler to fight on their side of the ring so as not to receive the water from either the opposite side or from a loser, which would be bad luck. However at the end of the day, one side will not have a winner or a next wrestler to give them the water. In this case the wrestler who was the last to win from their side will remain at the ringside in order to give them the power water. This individual is known as the kachi-nokori. An ōzeki who has suffered make-koshi in his previous tournament and so will be demoted if he fails to score at least eight wins. The present rules date from July 1969 and there have been over 100 cases of kadoban ōzeki since that time. Former grand champion's 60th birthday ring-entering ceremony. Fighting Spirit prize. One of three special prizes awarded to rikishi for performance in a basho. Term referring to practice or training in sumō. A playoff between two or more wrestlers in a division who are tied for the lead on the last day of the tournament. Prize money based on sponsorship of the bout, awarded to the winner upon the gyōji's gunbai. The banners of the sponsors are paraded around the dohyō prior to the bout, and their names are announced. Roughly half the sponsorship prize money goes directly to the winner, the remainder (less an administrative fee) is held by the Japan Sumo Association until his retirement. The loincloth fronted with a heavily decorated apron worn by sekitori wrestlers for the dohyō-iri. These are very expensive, and are usually paid for by the wrestler's organization of supporters or a commercial sponsor. Winning techniques in a sumo bout, announced by the referee on declaring the winner. The Japan Sumo Association recognizes eighty-two different kimarite. Gold star. Awarded to a maegashira who defeats a yokozuna during a honbasho. It represents a permanent salary bonus. Forbidden hand. A foul move during a bout, which results in disqualification. Examples include punching, kicking and eye-poking. The only kinjite likely to be seen these days (usually inadvertently) is hair-pulling. Little knot. The fourth-highest rank of sumo wrestlers, and the lowest san'yaku rank. These three bouts. The final three torikumi during senshūraku. The winner of the first bout wins a pair of arrows. Public Injury System. Introduced in 1972, this system allowed a wrestler who had been injured in the ring during a tournament to sit out the next tournament without any effect on his rank. It was controversially abolished at the end of 2003. Grabbing the front of the opponent's belt, placing one's head against their chest, and lowering one's hips in an effort to lower one's center of gravity in order to force out an opponent. Black star. A loss in a sumo bout, recorded with a black circle. A wrestler's absence from a honbasho, usually due to injury. Those ahead. The fifth-highest rank of sumo wrestlers, and the lowest makuuchi rank. This rank makes up the bulk of the makuuchi division, comprising around 30 wrestlers depending on the number in san'yaku. Only the top ranks (maegashira jō'i, 前頭上位) normally fight against san'yaku wrestlers. Also sometimes referred to as hiramaku (平幕), particularly when used in contrast to san'yaku. Front of the mawashi. Often referred to as a maemitsu grip when one has a hold of the front of the mawashi. Before sumo. Unranked sumo wrestlers in their first bouts. Participation in at least one maezumō bout is required to enter the jonokuchi division for the following honbasho. More losses than wins for a wrestler in a tournament. Make-koshi generally results in demotion, although there are special rules on demotion for ōzeki. The opposite is kachi-koshi. Changing from an overarm to an underarm grip on one's opponent's belt. If done properly can lead to a speedy victory, however if not done properly will often end in quick defeat. Below the curtain. The third highest division of sumo wrestlers, below jūryō and above sandanme. Originally the division right below makuuchi, explaining its name, before jūryō was split off from it to become the new second highest division. Inside the curtain. The top division in sumo. It is named for the curtained-off waiting area once reserved for professional wrestlers during basho, and comprises 42 wrestlers. Full house. Banners are unfurled from the ceiling when this is achieved during honbasho. However, it is not necessary to be at 100% capacity to unfurl the banner. Typically when seats are over 80% filled the banner is unfurled, however they have been unfurled with numbers as low as 75% and not unfurled with numbers as high as 95%. False start. When the wrestlers do not have mutual consent in the start of the match and one of the wrestlers starts before the other wrestler is ready, a matta is called, and the match is restarted. Typically the wrestler who is at fault for the false start (often this is both of them; one for giving the impression that he was ready to the other and the other for moving before his opponent was ready) will bow to the judges in apology. The kanji, 待, means to wait, indicating that the match must wait until both wrestlers are ready. The thick-waisted loincloth worn for sumo training and competition. Those of sekitori wrestlers are white cotton for training and colored silk for competition; lower ranks wear dark cotton for both training and competition. Water break. When a match goes on for around 4 minutes, the gyōji will stop the match for a water break for the safety of the wrestlers. In the two sekitori divisions, he will then place them back in exactly the same position to resume the match, while lower division bouts are restarted from the tachi-ai. A system of bonus payments to sekitori wrestlers. The discussion held by the shimpan when the gyōji's decision for a bout is called into question. Technically, the term refers to the querying of the decision: the resulting discussion is a kyogi. Deep double underarm grip which prevents the opponent from grabbing the belt. No Result. A kind of draw; the gyōji doesn't count a win or a loss. This outcome was recognised in the Edo period. The final bout of the day. The conservative style of calligraphy used in the banzuke. See sumō-ji. Clapping of the hands at the tachi-ai to distract the opponent. Japan Sumo Association, the governing body for professional sumo. Thrusting at an opponents throat. Something the referee shouts during the bout indicating to the wrestler on defense that he is still in the ring. Literally translates as "remaining" as in remaining in the ring. Literally ginkgo-leaf top-knot. This is the hair style worn in tournaments by jūryō and makuuchi wrestlers. It is so named because the top-knot is fanned out on top of the head in a shape resembling a ginkgo-leaf. It is only worn during formal events such as tournaments. Otherwise even top rankers will wear their hair in a chonmage style. There are two main types of wrestling in sumo: oshi-zumō and yotsu-zumō. Oshi-zumō literally translates as pushing sumo, and is more commonly referred to in English as a Pusher (oshi)-Thruster(tsuki). One who fights in the oshi-zumō style prefers fighting apart, not grabbing the belt as in yotsu-zumō, and usually winning with tactics of pushing, thrusting, and tsuppari. Oshi-zumō when done effectively can lead to a quick and decisive victory, but its exponents often fall prey to dodging motions or being slapped down, and may become helpless once the opponent gets a hold of their belt. Oshi-zumō fighters are generally thought of as simplistic, while yotsu-zumō fighters are seen more as technicians. Technique of holding one's opponent's arm to prevent him from getting a hold on one's belt. Literally, "push and affix" as in affixing the opponent's arm against one's body and preventing it from reaching the belt. A sumo coach, almost always the owner of one of the 105 name licenses (toshiyori kabu). Also used as a suffix as a personal honorific. Great barrier, but usually translated as champion. The second-highest rank of sumo wrestlers. Literally, Powerful man. The most common term for a professional sumo wrestler, although sumōtori is sometimes used instead. The strings inserted into the front of the mawashi for competition. The sagari of sekitori wrestlers are stiffened with a seaweed-based glue. Third level. The third lowest division of sumo wrestlers, above jonidan and below makushita. Three prizes. Special prizes awarded to makuuchi wrestlers for exceptional performance. Three ranks. The "titleholder" ranks at the top of sumo. There are actually 4 ranks in san'yaku: yokozuna, ōzeki, sekiwake and komusubi, since the yokozuna is historically an ōzeki with a license to perform his own ring-entering ceremony. The word is occasionally used to refer only to sekiwake and komusubi. Ritual preceding the final three bouts on the final day (senshūraku) of a honbasho, where three of the san'yaku-ranked wrestlers from the east and west sides in turn perform shiko simultaneously. Literally "Taken the barrier". Sumo wrestlers ranked jūryō or higher. The third-highest rank of sumo wrestlers. The final day of a sumo tournament. Senshūraku literally translates as "many years of comfort." There are a two possible explanations for the origins of this term. In Gagaku (雅楽, traditional Japanese court music) the term is tied with celebratory meaning to the last song of the day. In classic Nōgaku (能楽) theater there is a play known as Takasago (高砂) in which the term is used in a song at the end of the play. Today the term is used in Kabuki and other types of performances as well. Assistant. A retired wrestler (usually from the makushita division) who remains a member of the Sumo Association within his own stable to assist with various tasks, administrative or otherwise, in the stable and at tournaments and regional exhibitions. Toeing the mark. The preparation period before a bout, during which the wrestlers stare each other down, crouch repeatedly, perform the ritual salt-throwing, and other tactics to try to gain a psychological advantage. The two short white lines in the middle of the ring that wrestlers must crouch behind before starting a bout. The sumo exercise where each leg in succession is lifted as high and as straight as possible, and then brought down to stomp on the ground with considerable force. In training this may be repeated hundreds of times in a row. Shiko is also performed ritually to drive away demons before each bout and as part of the yokozuna dohyō-iri. A wrestler's "fighting or ring name", often a poetic expression which may contain elements specific to the wrestler's heya. Japanese wrestlers frequently do not adopt a shikona until they reach makushita or jūryō; foreign wrestlers adopt one on entering the sport. On rare occasions, a wrestler may fight under his original family name for his entire career, such as former ōzeki Dejima and former yokozuna Wajima. Ringside judges or umpires who may issue final rulings on any disputed decision. There are five shimpan for each bout, drawn from senior members of the Nihon Sumō Kyōkai, and wearing traditional formal kimono. Umpire committee. The shimpan as a group. New pupil. A new recruit into sumo. Heart, technique, and body: the three qualities of a wrestler. The most successful wrestlers will be strong in all three categories. Dead body. A wrestler who was not technically the first to touch outside the ring but is nonetheless ruled the loser, for example when he is pushed out with such force that he is still in the air when his opponent touches down. A designation given to wrestlers who had performed well in maezumō that allowed them to participate in jonokuchi in the same tournament. Additionally, if they performed well at this stage, they were allowed to skip straight to the jonidan rank in the next tournament. This system is no longer used. Occasion co-ordinated where new wrestlers who have been accepted into professional sumo are presented to audience; they wear borrowed keshō-mawashi during this ceremony which takes place on the middle Sunday of each tournament. White star. 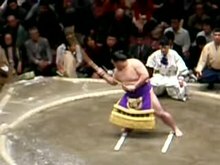 A victory in a sumo bout, recorded with a white circle. Master, teacher. A sumo elder in charge of a sumo stable. Preparation room. Room in which rikishi in the ranks of jūryō and above wait before their matches. This is where they will place their belongings, put on their belt, and warm up for their match. First day. The first day of a tournament, or the first win after a series of losses. Outstanding performance prize. One of three special prizes awarded to rikishi for performance in a basho. Prime Minister's Cup. Ceremonial cup presented by the sitting Prime Minister or an intermediary to the makuuchi champion at every tournament held in Ryogoku. Calligraphy style with very wide brushstrokes used to write the banzuke. Literally, One who does sumo. Sumo wrestler, but occasionally refers only to sekitori. The initial charge at the beginning of a bout. The two designated highest ranking gyōji, who preside over the last few bouts of a tournament day. The highest ranking gyōji takes the professional name Kimura Shōnosuke while the lower takes the name Shikimori Inosuke. Bales of rice straw. Tawara are half-buried in the clay of the dohyō to mark its boundaries. Hand print. A memento consisting of a wrestler's handprint in red or black ink and his shikona written by the wrestler in calligraphy on a square paperboard. It can be an original or a copy. A copy of a tegata may also be imprinted onto other memorabilia such as porcelain dishes. Only sekitori wrestlers are allowed to make hand prints. Knife hand. After winning a match and accepting the prize money, the wrestler makes a ceremonial hand movement with a tegatana known as tegatana o kiru (手刀を切る) where he makes three cutting motions in the order of left, right, and center. Emperor's Cup, awarded to the winner of the top division tournament championship since 1925. Sumo performed in front of the emperor. In the past women were forbidden from watching sumo, however nowadays the empress joins the emperor in watching sumo. They are escorted to their seats called kihin-seki (貴賓席), which are only used by the royal family, by the Chairman of the Sumo Association who sits behind them and explains the happenings. Hairdressers employed by the Sumo Association to style the hair of wrestlers and to fashion the elaborate ōichomage of sekitori for official tournaments and public engagements. A bout during a tournament. May also refer to a day's bout schedule. A rematch. When the result of a bout is too close to call even after the shimpan hold a mono-ii, they may call for the bout to be refought from the tachi-ai. A coaching license, of which there are a limited number of 105, which a recently retired sekitori, can either buy from its previous owner or inherit from his father or father-in-law. A rikishi in the lower divisions who serves as a personal attendant to a sekitori ranked wrestler. The heavy rope worn by the yokozuna from which that rank takes its name. It weighs about 15 kg, and is much thicker in front than where it is tied in back. Five shide (紙垂), zig-zag paper strips symbolizing lightning, hang from the front. It strongly resembles the shimenawa used to mark sacred areas in Shinto. To rapidly deliver harite (張り手 or open hand strikes) to the opponent. This technique is frequently employed by oshi-zumō wrestlers. Youth leader. A retired wrestler (usually a former jūryō or maegashira) who is a functionary of the Sumo Association, working with new recruits at his former stable or associated ichimon, and who also arranges maezumō matches. Sumo for elementary school-aged children. The national final is held at the Ryōgoku Kokugikan. "Put-up job" or "fixed game", referring to a bout with a predetermined outcome. Usher or announcer. General assistants at tournaments. They call the wrestlers to the dohyō before their bouts, build the dohyō prior to a tournament and maintain it between bouts, display the advertising banners before sponsored bouts, maintain the supply of ceremonial salt and chikara-mizu, and any other needed odd jobs. Horizontal rope. The top rank in sumo, usually translated Grand Champion. The name comes from the rope a yokozuna wears for the dohyō-iri. See tsuna. Yokozuna Deliberation Council, a body formed in 1950 whose 15 members are drawn from outside the Japan Sumo Association, that meets following each honbasho to consider candidates for promotion to yokozuna. A recommendation is passed back to the Sumo Association who have the final say. It also offers opinions on the performance of current yokozuna. There are two main types of wrestling in sumo: oshi-zumō and yotsu-zumō. Yotsu-zumō is where both wrestlers grasp the other's belt with both hands, hence the literal translation: four sumo or four hands on the mawashi sumo. There are a few sub-types of yotsu-zumō. Migi-yotsu (右四つ) is when one has sashite (差して) on the right (migi), meaning that one has his right hand under his opponent's left arm and grasping his mawashi. Hidari-yotsu is the opposite where one's left (hidari) hand is inside the opponent's right arm. A yotsu-zumō fighter will typically prefer left or right and is referred to as migi-yotsu or hidari-yotsu fighter. If one has no preference, they are referred to as namakura-yotsu (鈍ら四つ), where namakura literally translates as lazy or cowardly, suggesting that having no preference is seen in a negative light. There is one other final yotsu grip known as moro-zashi (両差し), literally sashite on both sides, where both hands are inside and is a very strong grip. The only real defense for a moro-zashi grip is the kimedashi (極めだし) technique where the defending wrestler wraps both of his arms over the moro-zashi grip and locks his hands underneath, which squeezes the double inside grip together, weakening it, and allowing one to force the opponent out of the ring. Kime-dashi is also known as kannuki (閂, usually written in hiragana as かんぬき), and means to bolt or bar. When two wrestlers who both fight in the yotsu-zumō style oppose each other and favor the same style grip, either migi-yotsu or hidari-yotsu, then they will fit together nicely in what is called ai-yotsu (相四つ), or together yotsu. If however they are of opposite preferences, then it is known as kenka-yotsu (喧嘩四つ), literally fighting yotsu. In this situation, whoever gets his preferred grip is usually the victor. The yumitori-shiki ceremony, performed by Satonofuji. The bow-twirling ceremony performed at the end of each honbasho day by a designated wrestler, the yumitori, who is usually from the makushita division, and is usually a member of a yokozuna's stable. A tournament championship in any division, awarded to the wrestler who wins the most bouts. Loose and disheveled hair. Term for style of hair before wrestler's hair is long enough to put in chonmage hair style. When seen in upper divisions it is a sign of a wrestler who has come up the ranks quickly as his hair has not yet had a chance to grow to a length in which it can be tied into a chonmage. In succession a wrestler starts with the zanbara style, then moves to the chonmage style, and then finally the ōichōmage style, which can only be worn by wrestlers in the top two divisions. A perfect tournament where, depending on the division, the wrestler finishes 15–0 or 7–0 in the tournament. ^ Hall, Mina (1997). The Big Book of Sumo (Paperback). Berkeley, CA, USA: Stone Bridge Press. p. 31. ISBN 978-1-880656-28-0. Look up Category:Sumo in Wiktionary, the free dictionary. This page was last edited on 29 January 2019, at 18:52 (UTC).